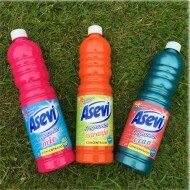 Asevi is a Spanish brand specialising in a wide range of cleaning products. Their signature cleaning products include the beautiful floor cleaners (pink, blue, yellow and blue). Additionally Asevi manufacture surface cleaners, bathroom cleaners and disinfectants and washing detergents and softeners. Take a look at the range of Asevi products stocked right here in the UK by Lemon Fresh UK. Some people love the smell of Talco and some love the smell of Rosa. Asevi have cleverly combi..
Asevi Rosa Mosqueta comes in a 3 Litre container and is perfect for washing all types of clothing.&n..
WASH GEL DETERGENT ASEVI ALOE VERA 42 washes 3 LitresDetergent super-concentrate.All type of clothes..
ASEVI WASH GEL DETERGENT JABON DE MARSELLA (Soap of Marseilles) 42 washes 3 Litres Detergent su..
ASEVI WASH GEL DETERGENT DELICATE WOOL 37 WASHES 1.5 LitresLiquid detergent.Fine and delicate articl.. FABRIC SOFTENER ASEVI SENSITIF Talco 60 washes 1.5 LitresConcentrated softener designed to give your..